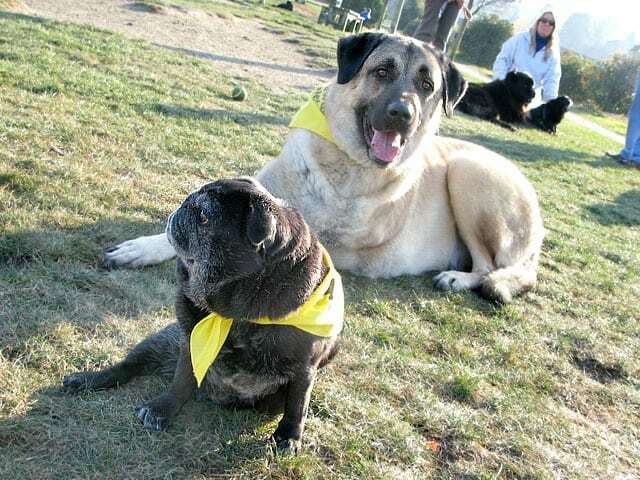 Tripawds come in all sizes, like TriPug Maggie and Cemil the three-legged Anatolian Shepherd. Get your Tripawds Rule! bandanna here. Too cute!! I love the bandannas. Aw what sweeties! Thanks for stopping by and visiting my blog too. Tripawd dogs are awesome! Great picture! Great photo and great group! Love the tenacity of these guys…three legs…who cares, bring it! Hanging out on a sunny day! Hope they enjoyed! Love it – WOOF WOOF WOOF! Loving the matching bandanas. Tripawd dogs rule! Happy WW! !